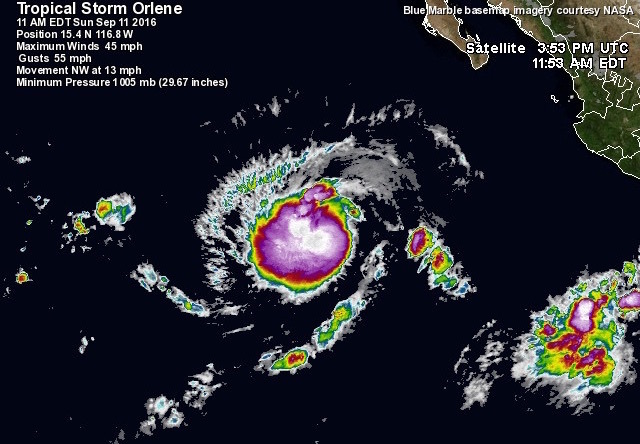 Tropical storm Orlene continues to strengthen in the East Pacific and is expected to reach hurricane status in the coming hours. Tropical storm Orlene continues to strengthen over the open waters of the eastern Pacific early Monday morning. Accu weather reports recent infrared satellite imagery appears to show the system attempting to develop an eye. Latest model guidance indicates Orlene to become a hurricane early Monday Morning as it continues to spin over the open waters. Expect no major impacts from this system with the exception of any shipping interest in the area. However, the strengthening of this system could increase surf off the Baja California coast early this week. Tropical storm is both enjoyable and horrible too! Trees get uprooted and any tropical forest gets affected to a great extent as a result of such storm. People living beside those areas should use instrument to measure wind speed and weather to save themselves.